The most powerful person in ancient Egypt was the pharaoh. We really does not know how many kings ruled in Egypt, for at times in its ancient past the country was split up, and there were at least several kings at the same time. There were also probably kings who ruled regions of Egypt before recorded history, and in fact, several ancient historians record legendary Pharaohs who became Egyptian gods. .Why the Ancient Egyptians Built Pyramids. .Pyramid Of Pepi I's Queens And Family. .The Temple of Alexander the Great. The White Chapel of Senusret I. .The Temples of Philae Part I. .The Book Of The Sky. .The Columns of Ancient Egypt. .The Spirits of Nature Religion. 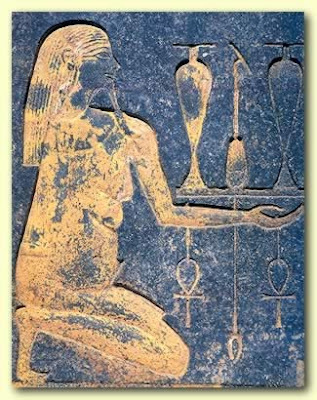 .Sobekneferu The First Certain Female King of Egypt. When archaeologists rebuilt the White Chapel of Senusret I in the Open Air Museum at Karnak on the East Bank of Luxor (ancient Thebes), it took many years to carefully arrange the layout of the structure like a big jigsaw puzzle on paper. 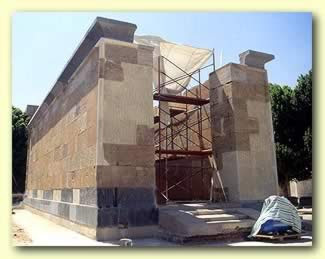 In 2001, when the Supreme Council of Antiquities decided to rebuild the Red Chapel of Hatshepsut (18th Dynasty) in the Open Air Museum, the process, like all of our modern lives, happened much quicker (though still a number of years), as they fed the architectural elements of the building into a computer. The results are splendid. What really sets the small monuments, such as the White and Red Chapels, in the Open Air Museum apart is their very well preserved state. When the Pharaoh, Amenhotep III decided to enlarge the temple at Karnak by adding a new facade in the form of two entrance pylons, he pulled down many monuments which he no longer thought relevant, putting their stone sections in the core of the structure. This was the Third Pylon at Karnak. At the end of the 19th century, a large part of the massive Third Pylon of Amenhotep III at Karnak toppled over during an earthquake. Then, in 1924, the director general of the Egyptian Antiquities Service, Pierre Lacau, ordered his director of works at Karnak, Henri Chevrier, to repair the structure. He had to completely dismantle it in order to do so, and in the process, he discovered some 951 blocks that belonged to a total of eleven different structures used as fill within the pylon. Though many of these blocks were damaged, their encasement in mortar in the pylon preserved their inscriptions and decorations. Chevrier was responsible for reconstructing the White Chapel of Senusret I many years ago, but the blocks from the Red Chapel of Hatshepsut remained dismantled until the 21st century. The Red Chapel of Hatshepsut was a barque shrine, as we believe was the White Chapel of Senusret I, built with a base and doorways of black granite (or more properly, gray diorite) with walls of red quartzite, from the quarry known as Djebel Akhmar, or "red mountain". Of course, the latter stone explains why the shrine is known as the Red Chapel. Actually, the natural color of the red quartzite varies, so the ancient craftsman painted all the block a uniform red color. It was probably begun about four years before Hatshepsut's death in about 1483 BC, and her nephew and successor (as well as defacer), Tuthmosis III may have continued work on the chapel, but never finished it. The chapel, which set at the heart of the Karnak com plex originally, was probably built to replace the earlier alabaster structure of Amenhotep I. It may have originally rested between her two obelisks in the temple, though this is by no means certain. For many years the blocks from Hatshepsut's chapel were displayed on low stone bases where visitors could wonder along the blocks and see the exquisite reliefs, carved on both sides, at close quarters. However, in 1997 a decision was made to reconstruct the shrine. This work, actually begun in March, 2000, is now complete (early in 2002). It was undertaken by the Franco Egyptian Center, directed by Francois Larche, with the support of the Supreme Council of Antiquities (SCA). The project was funded by the Accor Company, a consortium that holds about 30 percent of the hotel capacity in Luxor (as of 2002). This work resulted in a surprisingly large structure (over seventeen meters in length and over six meters wide) which now dominates the Open Air Museum. It is a strikin g building with its black granite and red stone walls. It has three doors at the same level and of the same dimensions. 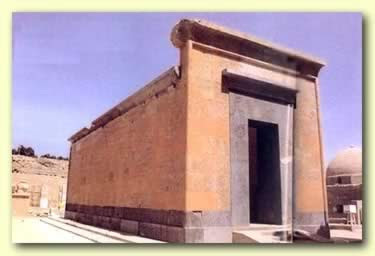 The structure is divided into two chambers, with a low plinth in the larger of the two rooms that was used as a base for the barque of the God Amun, who's image was carried in procession between the temples of Karnak and Luxor during the annual celebration that took place at the height of the Nile Flood. In the center of the chapel was apparently located a drain for the waters used in absolution during the celebration. The decorations of the chapel are particularly rich, with gold paint filling the hollows of the engraving. However, the only unfortunate aspect of this construction is that now many of the inscribed blocks, with their major motif being Hatshepsut and Tuthmosis III interacting with Amun-Min and various other gods, as well as scenes from the Opet festival, the dedication of the chapel, the establishment of the queen as ruler of Egypt and the recording of nome divisions, are more difficult for visitors to actually see since many of the carved scenes are high up in the walls and not always oriented for viewing. It has been suggested that a good pair of binoculars be taken along for a visit if any serious study is intended. 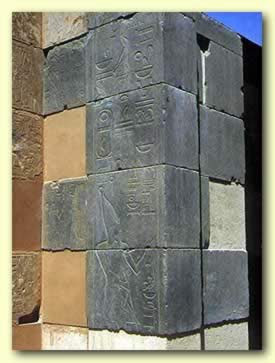 Bottom frieze inside: djedpillars, was-sceptres and ankhs.The frieze of leafs below them is probably lettuce leafs - sacred to Amun-Min. The barkshrine is dedicated to Amun and his fertility aspect Amun-Min. Both Hatshepsut and Thutmose III are depicted making offerings and performing rituals to Amun. 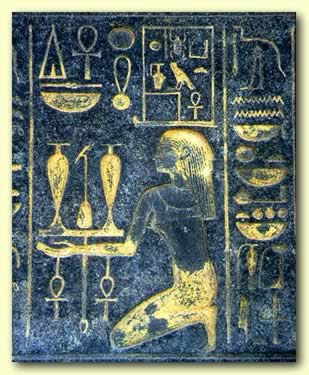 We see the King running in the Heb Sed, there are processions for the Opet with the Bark of Amun carried on the backs of priest, and we see Djehuty pouring purfying water over the King. Seshat records the events and assists Pharaoh in the rituals. A frieze of Sepat deities carry forward offerings around the outer base of the shrine. On the northern side, dancers and acrobats are performing, harpists are playing, sistra are rattled and food is carried forward. Left: Hatshepsut depicted as man, making the Heb Sed run before Amun-Min.Right: The Bark of Amun on its stand, surrounded by offerings..
Hatshepsut conducts the Bark of Amun across the river to attend rituals on the West Bank. Seshat, patron deity of records, assists Pharaoh Hatshepsut as she lays down the foundations to a new temple. 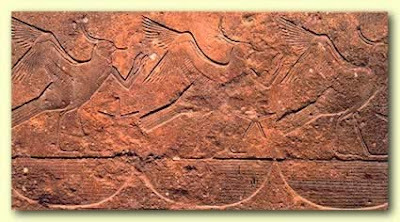 Upper register: Female acrobats perform and harpists play for Maat-Ka-Re.Lower register: Male dancers(?) pay homage and women play sistra for Maat-Ka-Re.